Ancona in January is bright and crisp, perfect winter weather in the Marche region of Italy. We are here to install a hand woven leather tapestry upon the main dining room walls of the liner. Jupiter is the latest Ocean liner to be built by this Fincantieri shipyard for the Norway based Viking Ocean cruises. Part of a fleet of small luxury ships being built, interiors designed by Rottet studio LA, artworks curated by ICART Oslo. Our tapestry weave is created from the finest marine quality leather selected from out tannery in northern Italy, woven by artisans in our UK studio. The studios specialist knowledge has allowed us to invent a production and handling methodology applied to upholstery grade leather hide. 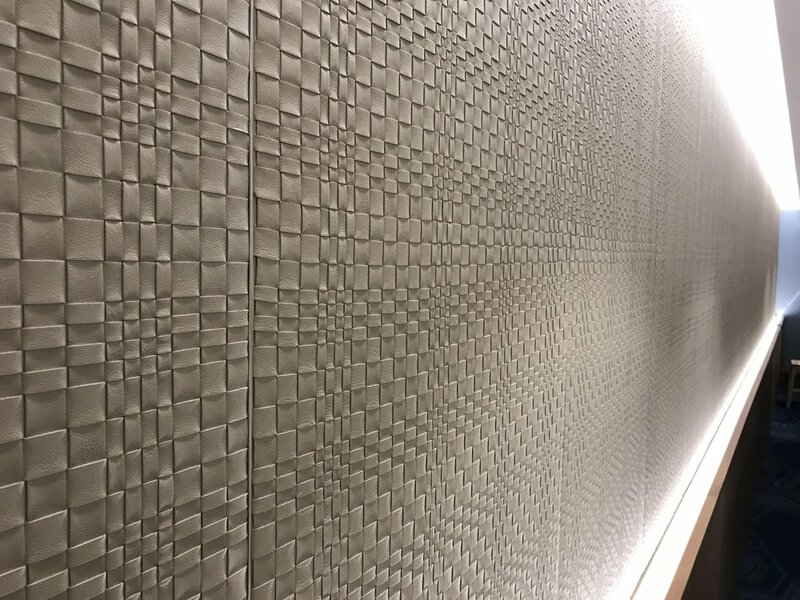 Changing the leather hides personality, eliminating distortion and skew to facilitate panel matching. Shown here is the ocean liner in Ancona yard, followed by hand woven ivory leather in a repeating thick and thin box weave pattern, using 10 mm and 20 mm leather straps. Ancona, Marche region of Italy.